On Monday 18 June, a group of serving A Level History teachers, academics from the University of Portsmouth and a team of staff and volunteers from the Mary Rose Education Department enjoyed a session on Teaching the Tudors. 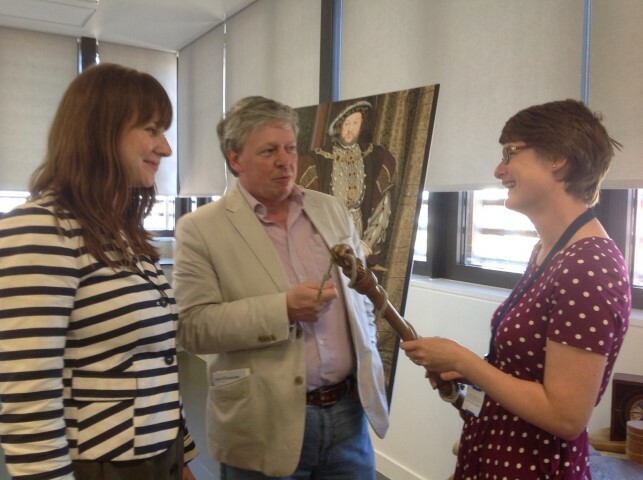 This partnership enabled the sharing of research and current thinking on King Henry VIII and the Reformation as well as the use of material culture, such as the Mary Rose collection, to enrich the curriculum. Religious upheaval and change during Henry VIII’s reign feature heavily in both AQA and OCR examination specifications. Dr Katy Gibbons, Senior Lecturer in History at the University of Portsmouth, presented a resume of key areas of past and current research into Henry VIII’s reformation highlighting differing schools of thought. Was it a fast or slow process? Did it come from the elite above or from below? As Dr Gibbons noted, if any consensus can be reached, it is to say it was a highly complex process. The struggle between politics, power, personality and religion produced a complex mixture of conflicting motivations for Henry’s actions in the period. It was generally agreed that current trends in historical research are broadening the field considerably; taking an inter-disciplinary approach using non-traditional sources in an attempt to gain a more complete picture and hear from a wider variety of voices. There is now a real appreciation of material culture and interpreting the objects and buildings we use in our everyday lives. Examples of surviving church decoration and prayer books highlight the range of responses to government decrees on the removal of images of saints. Inevitably, some people complied totally while others took a less rigid interpretation. St Thomas Becket was a particular focus for Henry’s displeasure having dared to question a king. Mary Kinoulty, Head of Learning, presented a session on using artefacts in class. Attendees were challenged to guess the purpose of a range of mystery Tudor objects and assess their significance for teaching the Tudors. The ship provides a rich seam of evidence for life in a deeply religious age. The naming of the Mary Rose, and her sister ship the Peter Pomegranate, is a reflection of the intertwining of church and state. According to the popular idea that the Mary Rose was named after Henry VIII’s sister Mary and the Tudor rose. However, it seems much more likely that the ship was named in honour of the Virgin Mary and the emblem of the Tudor dynasty. This mirrors the naming of the Peter Pomegranate, which links St Peter with the emblem of Catherine of Aragon. This seems entirely logical as the ship was commissioned shortly after the King’s first marriage in 1509. What is immediately striking is the extent to which religion was an integral part of everyday life. A wide range of artefacts of varying social status incorporate religious words and symbols. Wrist guards worn by the archers are stamped with symbols including the crucifixion and the crossed keys of St Peter. The lid of a large wooden tankard, which could hold a gallon of beer, is inscribed in Latin with ‘If God be for us, who can be against us?’ A leather book cover and balance case are both inscribed in Latin with ‘The word of the Lord endures forever.’ This text had been adopted as a Lutheran slogan. It is interesting to speculate that this implies that there were religious reformers on board the ship. Eight rosaries were found on all decks of the ship. Saying the rosary was still legal in 1545 but mechanical recitation had been condemned in 1538. Were they being used? Owning a rosary does not necessarily equate with pious practice. However, it is interesting to note that only one rosary was packed away in a chest. The others were with their owners. Although it is impossible to assess the religious beliefs of the crew, it would appear rosary beads were in everyday use on the Mary Rose. Taken as a whole, the artefacts from the Mary Rose provide evidence for personal devotion at a time of great religious upheaval. Although it is impossible to establish the precise religious affiliation of the crew, it is clear that religion part played an important part in their daily lives. For students, these artefacts provide a tangible dimension to a highly complex topic. The day concluded with a discussion about the transition from A Level to undergraduate in terms of History teaching and learning. Current University of Portsmouth final year student, Eleanor Doyle made a thought provoking presentation about contrasting experiences in both sectors. She offered helpful suggestions about how A Level teachers could prepare their students to make a smooth transition to third level study. Recent University of Winchester classics graduate, Natalie Bartlett (Learning Assistant at the Mary Rose) broadened the discussion to include other arts subjects. All the attendees felt the day was interesting, useful and enjoyable. We must do it again another year!